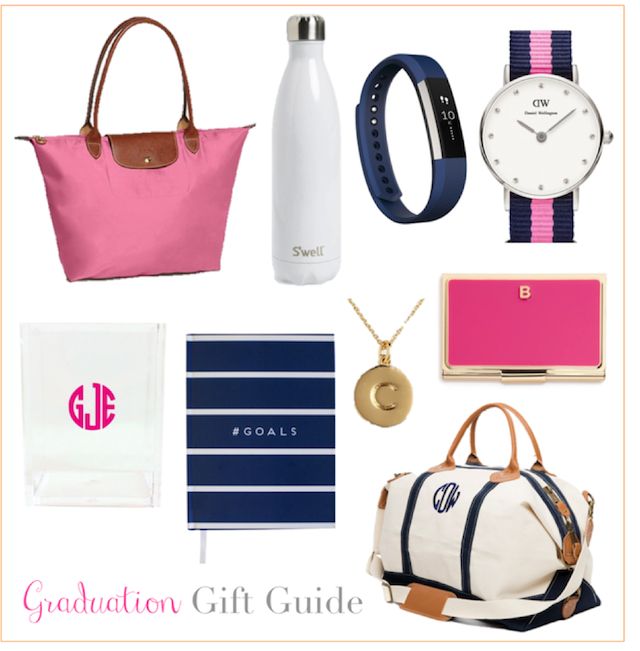 With graduation season upon us, it's time to stock up on gifts for all the graduates in your life! I have more graduation parties coming up than I can keep track of, so I've been brainstorming a lot of different gift ideas at all sorts of price points. Above I compiled a few of my favorites ranging from a great quality monogrammed duffel (which I had a giveaway for last week!) to the prettiest business card holder to an adorable pencil cup for a dorm desk. All of these items are gifts I would love to receive, and are cute (aka fun to open!) but also very useful in the future. Let me know if there are any other graduation related posts you want to see on the blog soon. A recap of my graduation will be up early next week (I graduate this Sunday!) and I'm thinking it would be fun to do a graduation party inspiration sort of post too! Love your graduation gift ideas. Gifts that I have given high school graduates and they seem to love them are monogrammed pillows, bedding, and towels from Southern Linens on Etsy. They are beautifully made and really brighten up a college dorm room. On Moon Bitcoin you can get free bitcoins. 163 satoshi every 1 hour. Actually here you have showed the fresh looking pictures of graduation gifts ideas. Which definitely very helpful for us. I always suffer while selection of gifts but now this site is enough for me which have solution of my problem. However, I try to know about http://www.essayswritersland.com/essaylab-com-review/ to read a lot of reviews and want some more reviews and while doing this one i got this article. One of the uk replica watches earliest series produced by the rolex replica nations, developed specifically for pilots.Early aircraft are mostly fighters, so replica watches uk a variety of functions. hacking tools are available here.